Dark Moon Books, 9781949491012, 346pp. Welcome to the cool side of the 1950s, where the fast cars and revved-up movie monsters peel out in the night. Where outlaw vixens and jukebox tramps square off with razorblades and lead pipes. 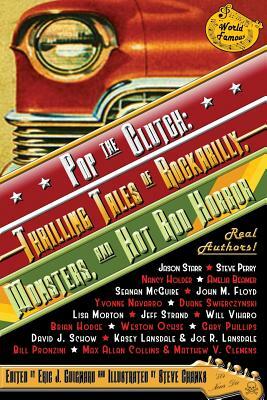 Where rockers rock, cool cats strut, and hot rods roar. Where you howl to the moon as the tiki drums pound and the electric guitar shrieks and that spit-and-holler jamboree ain't gonna stop for a long, long time . . . maybe never. This is the '50s where ghost shows still travel the back roads of the south, and rockabilly has a hold on the nation's youth; where lucky hearts tell the tale, and maybe that fella in the Shriners' fez ain't so square after all. Where exist noir detectives of the supernatural, tattoo artists of another kind, Hollywood fix-it men, and a punk kid with grasshopper arms under his chain-studded jacket and an icy stare on his face.